The Solomon R. Guggenheim Foundation promotes the most visionary and avant garde art worldwide by developing an international constellation of museums around the world. And these museums explore design by combining the risk-taking spirit of the organization and authentic culture of each indigenous site. The task now is how to bring the Guggenheim spirit to Helsinki. Helsinki is a historical city embedded in spectacular natural surroundings. The tradition of construction here is to build with respect of the natural context, as seen in the buildings of Alvar Aalto and many other structures like the famous Temppeliaukio Church in the city center. It is important for a preeminent public building to establish a balance between human development and nature. The site of Guggenheim Helsinki is located in the old harbor area besides the Tahititornin Vuori Park and the sea, a strategic point to transform the waterfront of the city. The essence of the location is in-between the green park and the blue water; both of which are dominant natural elements. Therefore, our idea is to submerge the museum within the green and the blue structures, therefore returning the site back to its natural context. The ground floor of the museum shall extend the horizon of waterfront to the exhibition hall, and gradually emerge up to a wavy platform inside the building. Visitors could either rest and look back at the harbor scenery, or gather and socialize on these inclined floors. The east facade shall be a transparent glass wall to host the best view of the sea. The roof’s top layer slopes down to the west side of the park, forming a pedestrian track by connecting two overpasses from the museum roof to the ground sidewalks in the park. The highest point of the the museum is the Belvedere on the roof top with a height of 24 meters, which will offer a panoramic view of the harbor area. Thus the waterfront is not block by the museum, on the contrary, the blue and green are in a way re-connected. In between the roof slope and ground floor there are 8 exhibition boxes floating between the space, resembling the image of many islands from the Nordic Sea. Outside these boxes, the random polar structures recall memories of the forests which cover 3/4 of Finish territory. 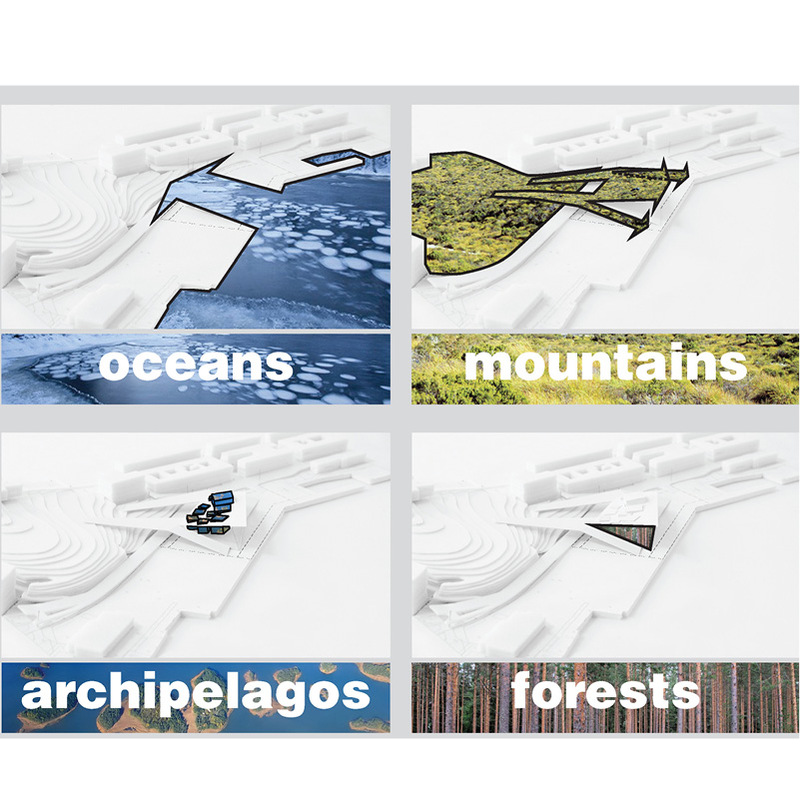 In total, the structure of Guggenheim Helsinki museum could be summarized by four images — the ocean, the mountain, the archipelago, and the forest. These are also the particular elements innate to the surrounding natural environment of Helsinki. Visitors to the museum could easily find a way to be close to the mesmerizing natural environment while also experiencing the art installations of the exhibition galleries. We hope the Guggenheim Helsinki museum could be a placid space between the mountain and sea, where the public could enjoy the celebration of art and nature.